The enormous semicircular Puerta del Sol is the heart of the city. This plaza, which is the junction of eight streets, is officially the center of the nation: a stone slab in the pavement outside the Casa de Correos (1766) marks kilometer zero, from where Spain's six national roads begin. A statue of a bear pawing a madroño bush lies on the north side; this is both the emblem of the city and a favorite meeting place. Immediately north of Sol, calle Preciados and calle del Carmen head towards the Gran Vía, both are pedestrian and constitute the most popular shopping area in Madrid. Towards the west run calle Mayor and calle Arenal. Calle Mayor takes you to the Plaza Mayor. In 1617, the colonnaded Plaza Mayor became the area's hub; today, with its mix of Habsburg, French, and Georgian architecture, it is one of the key day and nighttime centers of tourist activity. It's filled with cafes, bars, and shops selling everything from turn-of-the-20th-century souvenir hats to stamps and rare coins over the weekend. Concerts, shows, and exhibitions are often held here, and at Navidad, it's a child's delight with a proliferation of Christmas trees and stalls selling gifts. The lavish Reyes (or Three Kings) processions originate from here on January 6 amid much excitement. Permanently crowded with shoppers and sightseers, the street is appropriately named 'the great lane', with splendidly unusual Art Nouveau and Art Deco facades fronting its banks, offices and apartments, and huge posters on the cinemas. During the 1920's, the Gran Vía became an area where inhabitants could stroll around, with many shops, insurance company offices and leisure buildings that combined cinemas, theatres or varieties. It cuts a bow-shaped, east-west wrap across the center, between the neoclassical Metrópolis building near the Banco de España and the Plaza de España. The numerous theaters that line Gran Via are reminiscent of Broadway in New York City. The Plaza de España is one of Madrid's largest and most popular squares. On a sunny day it is filled with street vendors, tourists and sunbathing locals. Located close to the Palacio Real (Royal Palace), the site was occupied by Torre de Madrid (a barrack). After it was demolished, a new public square was created. 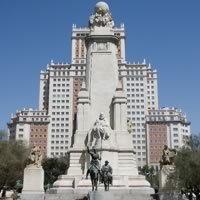 It became a popular meeting place in the 1950's, after two of Madrid's largest buildings were constructed, the Edificio de España and the Torre de Madrid. The most popular sight at the Plaza de España is the monument to Miguel de Cervantes, writer of the world famous story of Don Quixote de la Mancha and his trusty squire, Sancho Panza. This tree-shaded and maturely beautiful avenue is home to incomparable city gems. 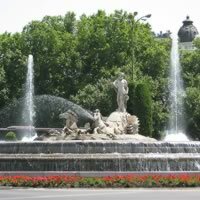 Covering the area from Cibeles to Atocha, Paseo del Prado can be considered the core of aristocratic and institutional Madrid. The area contains the Prado Museum, the Thyssen Bornemisza Museum, Reina Sofía National Art Centre Museum, the Jardín Botánico (Royal Botanical Gardens), Palacio de las Cortes (the Spanish Parliament), the fountains of Cibeles, Neptuno, the Bank of Spain, the Madrid City Headquarters, Spain's Stock Exchange, The Zarzuela Theater, Círculo de Bellas Artes and Casa América - two of the best cultural institutions of the city, Hotel Ritz, Hotel Palace. It's also an exceptionally quiet area given its central location. To the east lies the Parque del Retiro, a magnificent park once reserved for royalty, with rose gardens, wide walkways, terrace cafes, fountains, statues (including the only one in the world dedicated to the devil), musicians and entertainers, a rowing lake (the Estanque), and Madrid's finest homage to the Industrial Revolution - the iron, tile, and glass built Palacio de Cristal (Crystal Palace). Located east of Puerta del Sol and north of Lavapiés, Huertas holds an assemblage of theaters and nightlife options, especially in Plaza Santa Ana and along the streets Calle del Príncipe and Calle de Echegaray. Also known as Barrio de las Letras, as this is where Spain's most celebrated Golden Age authors Miguel de Cervantes, Lope de Vega, Calderón de la Barca, and Tirso de Molina lived during the 17th century. Now full of traditional bars and restaurants, Huertas is one of the most popular places to go out at night for a drink or a tapa with friends. Plaza de Santa Ana is the heart of the Huertas neighborhood. Hotel Reina Victoria is one of the coolest places to go at night for a drink at the Penthouse. The Reina Victoria was a traditional bullfighter's hangout. The streets radiating off its core, Plaza de Santa Ana, are packed with tapas bars and disco-pubs, popular as much among Spaniards as with an international crowd. The eastern border of Huertas is Paseo del Prado, also known as Paseo de las Artes or 'Boulevard of the Arts', which lies between the emblematic Plaza de Cibeles and Estacion de Atocha. 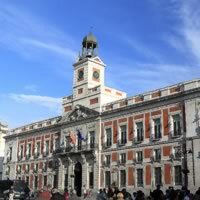 The southern border is calle Atocha, which runs all the way from the train station to Plaza Mayor, and the northern border is Carrera de San Jerónimo, which ends at Puerta del Sol. Atocha includes a rather large area that extends from the Atocha railway station up to the Huertas area on one side and Lavapiés on the other. 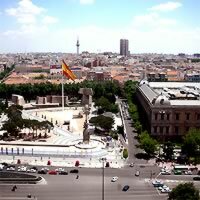 Two important sites located in this area are the Reina Sofía Museum, which houses Picasso's Guernica (Museo Nacional Centro de Arte Reina Sofía) and the Atocha Railway station. In the area there are also a number of art galleries and restaurants. There are many hotels around the station and wandering about the smaller streets in this area one can find small shops selling a range of curiosities. 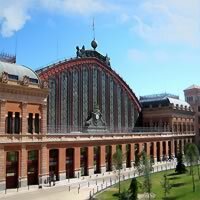 The massive crystal and brick Estación de Atocha across the street is Madrid's first and largest train station dating from the 19th century. Don't miss the strange but lovely tropical greenhouse in the station's main entrance, part of the reform by Rafael Moneo. The Ananda Terrace is a club located in Atocha Station and open from 11pm to 5am. It is a place to see and be seen against a background of avant-garde and surprising décor. In Atocha is also the monument to the victims of the 2004 Madrid train bombings. Plaza de Colón, honoring Christopher Columbus, is located in the Alonso Martínez district on the Paseo de la Castellana. It is an impressive plaza with a classic monument to Columbus in the middle of the traffic and a modern stone monument on the side, also for Columbus. The skyscraper Torres de Colón, a huge Spanish flag, a large branch of Hard Rock Café, a large fountain and gardens (Jardines del Descubrimiento) and the National Library can also be found around the square. The Colon bus stop is but one of the attractions under the plaza. 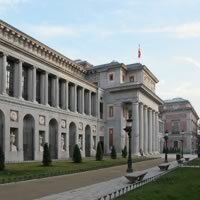 The cultural center, de la Villa de Madrid, is also located beneath the plaza. At the base of the Columbus Monument is a fountain with a huge cascade of water. At the ends of the fountain are stairs leading down under the cascade. There is also the Museo Archeologico Nacional (the National Archeology Museum), an impressive collection of Iberian prehistoric artifacts, including Dama de Elche, a rare stone bust of a 4th century B.C. Iberian woman, Roman mosaics, Moorish arches and a crown from the Visigoths. Plaza de Colón's eastern side stretches along calle Serrano. Serrano is packed with luxury stores like Gucci, Carolina Herrera and Yves Saint-Laurent, as well as Spanish designers such as Adolfo Domínguez, Loewe, Purificación García and Hoss, along with some affordable Madrid shopping options like the Zara mega-store. El Jardín de Serrano is a high quality shopping gallery located in two restored 19th century palaces in the heart of Salamanca's district. Here you will find names with recognized national and international prestige offering exclusive and elegant fashion, jewelry, gifts and accessories. All this in a welcoming atmosphere to shop, stroll, have a cup of coffee or eat dinner. Ever since the city walls came tumbling down in the 1860's, this elegant, stylish, and expensive neighborhood east of the center has been one of the most fashionable areas to live in Madrid. Some of the city's most traditional covered markets are tucked away here. Calle Serrano marks the western border of this neighborhood and is lined with international shops, stores, and boutiques. The U.S. Embassy is located halfway up the avenue, close to the Lazaro Galdiano Museum. This neighborhood, bounded by Paseo de la Castellana, Calle Alcalá, calle María de Molina and Francisco Silvela, is one of the few parts of the city with a well defined urban structure. Blocks in the area are square and streets run parallel and perpendicular. 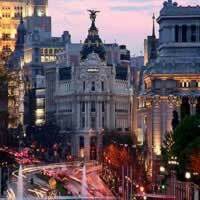 It has a reputation for being the wealthy neighborhood in central Madrid, and some of the most exclusive boutiques in town are located there. Its main streets are Serrano, Velázquez and Goya.